I don’t really have a bucket list. Although I have written about NOT having one. But of course, there are things that have been floating around in my brain that I know I’d like to do someday. And also of course, I’d like to do them before I die, since I think it would be hard to do some of them after I die. Although perhaps getting my novel published might be easier when I’m dead. I’d like to see the Grand Canyon. My husband has been there. He knows I’d like to go too because I might have mentioned it a few (hundred) times. He has no objections to going again. But he’d like to drive out there. From Connecticut. In a camper. A camper is NOT on my list of things I’d like to experience. Maybe he could drive out and meet me. I’ll be staying at a bed-and-breakfast. And I’d like to see “Carmen” and “Madame Butterfly.” My husband accompanied me to the opera once – to see “Tosca.” And he liked it. If I remember correctly, he said, “I’m really glad I got to experience that. I don’t care to experience it again.” So any future opera excursions will have to be with a girlfriend. It’s for the best. I’d like to meet a movie star. Not just “How do you do?” as I said to Helen Hayes back in the 70s. I’d like to sit down and have a conversation with someone super famous – the kind of person that everyone else just turns around and stares at. I don’t want it to be an idiot though, so it has to be someone SMART and famous. So that probably really limits my choices. I’m leaning towards Steve Martin for some reason. I think he would be fun to talk to. I wouldn’t object to Ralph Fiennes. I have no idea if he is smart but I’d make an exception in this case. One other thing I’d like is to have a perfume designed just for me. It would suit me so perfectly that it would make people smile when they walked by me. And I’d feel serene all the time. You could make a left hand turn from the right hand lane directly in front of me and I wouldn’t even mind. I could read sentences with “your welcome” and “back in its’ own place” and “I win, you loose” and my head wouldn’t even explode. A few evenings ago my husband and I were driving through town, and I was enjoying the Christmas decorations in all the yards. I don’t like big bouncy blow-up things – and they always seem to be half-deflated and vaguely reminiscent of used condoms. But I like lights, especially little white lights. I’m confused though by the proliferation of lighted deer. They are kind of pretty, but I’m not sure what they signify. I mentioned this to my husband, and he said he thought they were reindeer. Which makes more sense, but to me they look more like Bambi than Blitzen. And I remarked that it would seem more Christmas-y if they were camels. And I started to think about camels. And I realized something. “You know what I would really like?” I said to Hubby. To go to the Grand Canyon?” he guessed. “Is this some long-standing desire you’ve had since you were a little girl?” he asked. And I was just about to look at the Met website to see what they had in the Spring. And I like the music in both of those. It’s a date. I love the way your imagination goes wild. Riding on a camel – now that’s a new one for a bucket list. My wishes are more mundane – one might be I would like to hire a personal trainer. We will definitely go. I am skeptical about the camper however…. Should I ask Steve Martin if he wants to ride a camel with me? Keep harping on that Grand Canyon trip. It’s like a trip back in time. Do you do the drawings? That one is a trip! Yes, drawings are mine. I’m happy with the way the camel came out – I’d never drawn one before. But it looks like he likes me! You’re very talented. Personally, I have trouble with stick figures although my mother was a very talented artist. They say it skips a generation. Do you think he is saying that just before he spits on me? Nah. I can tell from the way you drew him he’s a laid-back camel. Perhaps a camel scented perfume? You know, kill two species with one stone. I think there’s someone in the office with camel-scented perfume… I will skip it. 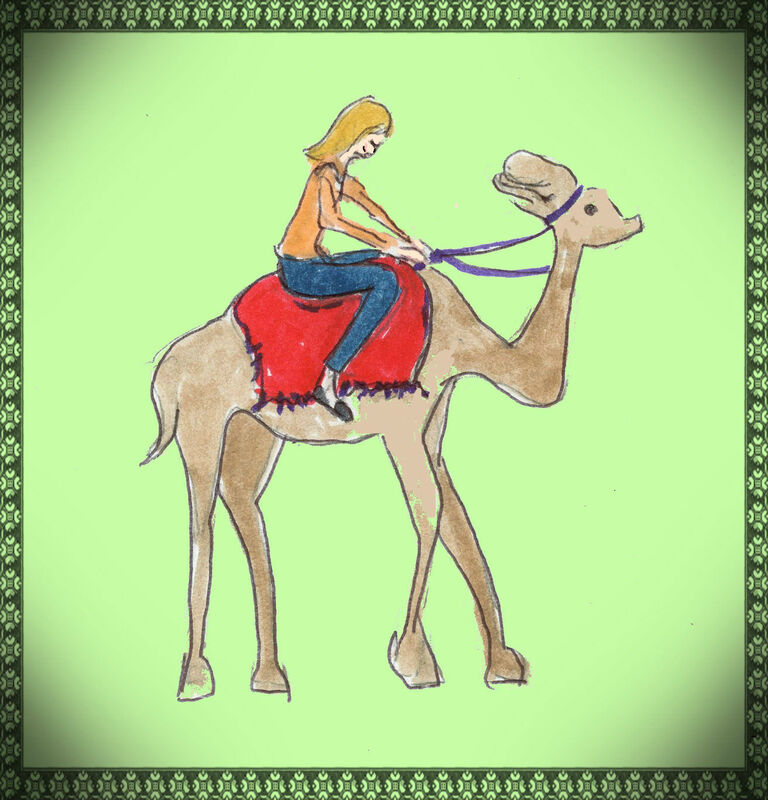 great post… hope you get to ride a camel through the grand canyon someday… btw… our family and another family did a six week camping (in tents) trip from southern CA across to Prince Edward Island and back again… six weeks, five kids, four adults, one vehicle…. yep, don’t really recommend it, but we saw some great sights! In a moment of weakness brought on by wine, I promised my husband that we could rent a camper and try a short trip. I am hoping he was too drunk to remember. That he will remember… anything important he won’t. Good luck!! Hope you defined ‘short trip’ also! Maybe you could combine all of your most important bucket list items and it might look something like this: you’d ride a camel (instead of a mule) down into the Grand Canyon on Bright Angel trail, accompanied by a really famous movie star who compliments you on the wonderful fragrance you are wearing. This would start a deep, deep conversation that would so impress the movie star, that he would invite you to his large villa and you two could concoct plans to….. oh well, I’ll leave the rest of the fantasy to you….have fun. In that case, I would make it Ralph Fiennes. Great post, but the one thing that I nodded my head at was “your welcome’. Sheesh, does that ever drive me crazy. Do the teachers not have red ink pens to mark those mistakes any more??!!! And give the student a lower grade….or at least TEACH them the correct word? I’ve thought about writing a post about it, but half my friends and family are offenders, and of course, I don’t want to offend them! So I guess my head (like yours) will remain in danger of exploding. It’s the -It’s- and – its – and even -its’- (what the heck is that?) that drive me crazy. I’m going to google that right away! Even if it’s and old ladies’ sock drawer it will be MY old ladies’ sock drawer! it’s actually pretty neat .. I would do it again .. but choose alternates! Oh gosh, just don’t ever ever go on a camel downwind or down the Grand Canyon! They are wicked. Lots of fun, but you have hold for dear life! I will let my camel share my perfume, so we will both smell nice as we descend the Grand Canyon. Oh if were only the smell…it’s not for nothing they’re known as the ships of the desert. But hey–it’s your un-bucket list! I have ridden a camel. Until you brought it up, I hadn’t thought about it in years. He didn’t spit…was very tall…the little granddaughter of a friend was on the camel with me…beyond that, it was not that memorable, I guess. There use to be a place in where you could mix your own perfume, I cannot for the life of me remember the name of the place but it was a chain. It was quite nice. I did it once. Camels don’t just spit, they smell. I would go to the opera with you, anytime. I have to ask…one hump or two? I’m a one-hump kind of girl. There’s something unnerving about that second hump. Delightful post! Riding a camel is really fun — they are incredibly tall and a smooth ride! They are one of my favorite creatures. I love your illustrations and forgive me but I am still new to your blog — do you draw them yourself? They are really great, and the stories are too! Thanks, yes, the drawings are my own. I didn’t start out with illustrations, but they sort of evolved. Now they are as much fun as the writing. The last time I was at the Bronx Zoo (a decade ago, I think), they had camel rides in Asia.